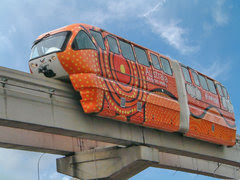 The famous KL Monorail is very small and cute. We did get to ride the monorail on a few occasions and we just loved it. 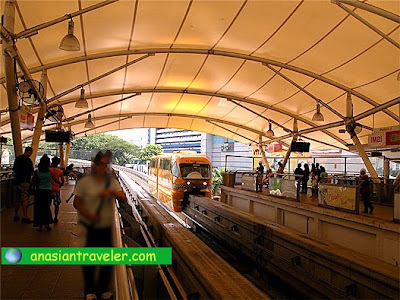 The monorail connects KL Sentral with major hotels and shopping malls in the city. 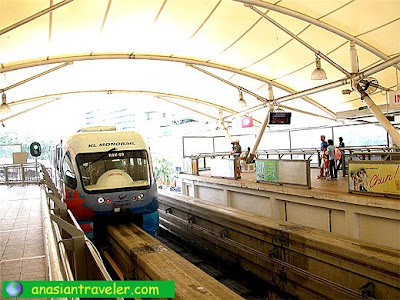 The starting point of KL Monorail is situated about 100 meters away from the KL Sentral Station. With a total of 11 fully elevated stations, the KL Monorail is currently capable of handling up to a maximum 5,000 passengers per hour per direction (PPHPD), operating at 3 minutes headway with 12 numbers of 2-car trains. Operating hours is from 6:00am to 12:00 midnight. The KL Monorail operation is semi-automatic with full fail-safe, train protection. Its vehicle is also designed to be highly resistant to fire, toxic fumes and gases. There is a back-up power failure. All trains are operated by a driver positioned at the head of the train for passenger comfort and assurance. Nevertheless, the operations of these trains are monitored at each individual station and a Control Center equipped with full fail-safe train technology system. Straddly type monorail systems are inherently quiet therefore it is noise free. The KL Monorail Fare is from RM1.20 to RM2.50 depending on distance. Commuters may use Touch 'n Go cards as an alternate method of payment to access monorail services. KL Monorail offers RM20 and RM50 Stored Value Tickets which allows a last bonus ride with whatever remaining balance in ticket value. Tickets are available at all KL Monorail stations.